If you’re in a hurry, check out our top pick, Linksys Velop Tri-band Whole Home WiFi Mesh System. Wireless internet has become an integral part of our lives. Whether for personal or professional purposes, having good Wi-Fi is essential to keeping you connected and your life flowing smoothly. This is especially true when you need good wireless capabilities. As you’re probably aware, wireless signals do not pass through walls and ceilings very well. In fact, the further you are from your router, the weaker the signal is going to be. This often poses a problem in large homes, as the modem and router are often quite a ways from upstairs bedrooms. When you’re dealing with internet in the workplace, the problem is compounded. Let’s use a hospital as an example. It’s very important for doctors and nurses to be able to connect to the internet to access local cloud data, transmit data, connect with customers and a myriad of other activities. Hopsitals are typically large buildings, with several floors and dozens or hundreds of rooms. A single wireless router is not going to blanket the building in wireless internet. How Does Wi-Fi Mesh Networking System Work? In the past, wireless boosters have been used with Wifi Routers to enhance tour router signal and improve performance. However, while boosters extend the signal, they do not spread it as effectively as you might hope, and wireless signals still struggle to pass through physical obstacles. This is where mesh wireless receivers come in. They intercept the wireless signals from your router and convert it a mesh blanket, dramatically increasing the effective range of your Wi-Fi. There’s no limit to how many you can install, either. You could install two mesh receivers in critical locations or blanket a large commercial office with eight or ten of them. Wireless mesh systems are relatively inexpensive and are an excellent way to expand your internet coverage in your home or office. If you’re tired of sluggish internet performance and are looking for better wireless reception, Wi-Fi mesh systems are the answer. Get rid of your old wireless router, and upgrade to the future. Not all wireless mesh systems are made equal. They all have different abilities, and some are more powerful than others. Here are some things to consider before you invest in one model over another. Coverage is perhaps the single most important thing to consider when you’re buying a Wi-Fi mesh system. The main draw in purchasing wireless mesh is the improved coverage, after all. Although coverage area is critical, it should not be your only basis for comparison, however. One thing that’s important to remember is that Wi-Fi mesh systems come with their own router. This is because mesh systems distribute wireless signals differently than standard routers. They still require a modem, however, so modem/router combos will not work well with Wi-Fi mesh systems. One of the benefits of mesh systems is that mesh hubs typically come with LAN ports for direct internet connections. As you may know, Ethernet connections provide a better internet connection, which is ideal for online gaming. Because of this, you can easily set up a gaming system in a room and still plug it in directly to your cable internet. The number of units in your mesh system has a lot to do with coverage, but it is a separate consideration, as different brands offer different areas of coverage. What’s important to note is that you only need one unit for the mesh to work, but there is no limit to how many you can implement in your home or office. Just like modems and wireless routers, the price of Wi-Fi mesh systems can vary dramatically. When it comes to price, it’s important to see how many hubs are included in your purchase. As new as mesh Wi-Fi networks are, there are a lot of great options for you to choose from. Out of them, two stand out above the rest, with the Linksys Velop being the clear victor. It’s tri-band frequencies, excellent coverage and amazing data transfer speeds are all far above the competition. Powerful tri-band wireless signals offer data transfer speeds of 6000 Mbps. Most tech experts agree that WiFi mesh network systems are the future of wireless internet. In fact, it’s entirely possible that they will replace wireless routers and range extenders in the next decade. 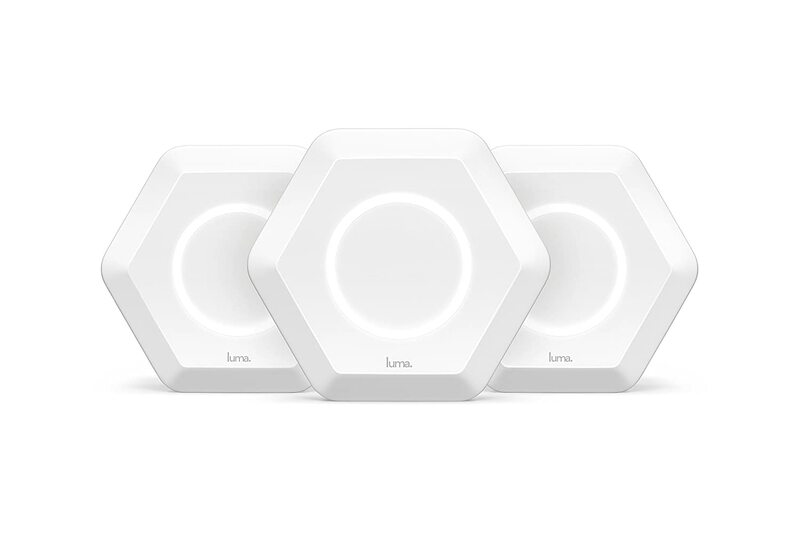 The Luma Whole Home WiFi System is available individually or in packs of two and three. This review is focused on the three-pack. For those who opt for a single WiFi hub, it is connected to your modem just like a router. The difference is that it blankets the area in wireless signals, providing coverage without annoying dead zones and frustrating buffering. Each unit is rated for 1000 square feet, so a single pack is perfect for a studio apartment or small office space. Most users, however, and especially those using Luma for business, will want at least three mesh hubs, if not more – one of the great things about these systems is you can buy as few or many as you want! The three-pack covers up to 3000 square feet, and the difference in coverage between this and a standard wireless router – even with range extenders – is noticeable. While some routers are better at sending signals than others, none can match the thorough coverage of a wireless mesh. Luma Whole Home WiFi does more than just improve your internet connection. ; it provides valuable protection from harmful computer viruses! Luma is equipped with anti-virus and malware protection software. While it is never a good idea to leave your computer unprotected, these virus protection programs act as an initial defense against unwanted invasions. That’s not all Luma can do, either. You can set up multiple user accounts on your network, with password protection to restrict access. You can also assign parental ratings to all of your networks, ensuring your kids won’t accidentally stumble upon inappropriate or harmful content. There’s more. You can control your internet access remotely, even going so far as to pause your internet serviced. Luma is also designed to work with Amazon Alexa, making it easy for you to prioritize certain smart devices when you want. Luma Home WiFi isn’t the best mesh network system out there. There are other systems that offer considerably more coverage than Luma. This doesn’t necessarily make Luma an inferior system, however. You get what you pay for, of course, but with Luma you’re paying for an excellent product. It’s always nice to have multiple options to fit your budget, and the TP-Link Deco M5 Wi-Fi System provides an alternative to Luma Home WiFi for a comparable price. The Deco M5 Wi-Fi System can help you say goodbye to buffering and put an end to those nasty dead zones. One of the most notable differences between the Deco M5 and Luma Home is the area coverage. Where each Luma unit covers approximately 1000 square feet, Deco M5 covers 1500 square feet. Thus, a three-pack mesh system from TP-Link offers 50% more coverage for roughly the same cost. Superior coverage isn’t everything, of course, but TP-Link doesn’t slack off in other departments either. Internet security isn’t one of them, however, and the Deco M5 offers superior anti-virus and malware protection. Deco M5 doesn’t just protect your computer, however – it protects all of your wireless smart devices. The Deco M5 offers an array of parental controls at your fingertips. You can set your individual networks to Pre-K, Child, Teen and Adult, and you can even designate block certain types of websites, no matter what the age restriction? Is your teenager grounded from Facebook? Restrict access to all social networks on your teen network, and the M5 will impose your grounding for you. There are more features as well. Optimized bandwidth, guest networking, speed tests – there’s too much to mention. Perhaps most impressive is its ability to expand. A single unit covers 1800 square feet and the three-pack covers 4500. You can expand your mesh network to nine units, blanketing some 13,500 square feet with seamless network access. It’s hard to argue with that. Google products are everywhere these days, and that can only mean one thing: an improved variety of choices at your disposal. The Google WiFi System is quite comparable to Deco M5 from TP-Link. Both mesh networks are sold in packs of one and three and both cover an area of 4500 square feet. Network assistance provides constant management of your wireless data, helping to keep your internet working as fast as possible at all times by prioritizing your data and bandwidth for all of your connected devices. Google WiFi also gives you parental controls so you can control what your kids do and don’t have access to. You can also pause the WiFi access to their devices at will, preventing them access when they’re doing homework or at mealtime, for example. Business professionals will appreciate the ability to manage and control what their employees can access, disabling social networking and other time-killing websites that diminish productivity. In the end, though I have to give the Deco M5 higher marks than Google WiFi. WiFi coverage performs just as well, if not even a little better. However, it doesn’t offer any anti-virus or malware protection that I am aware of, the system cannot be accessed through a browser – not even Chrome, the hubs don’t have USB connections and you cannot customize your DNS network. I’m also not sure how many devices you can support at once. This is a Google product, so I would be shocked if its abilities remain static. Google WiFi provides great wireless mesh coverage, but it may not be ready for professional use just yet. If you’re looking for the ultimate in long-range wireless mesh coverage, you want the AmpliFi HD Home Wi-Fi System. AmpliFi is rated for a max coverage of up to 20,000 square feet! Naturally, I wasn’t able to test it on an area that large, and I’m not sure if the two mesh transmitters included are sufficient to achieve that range or if more are necessary. It almost doesn’t matter, however, 20,000 square feet is such an enormous range for a Wi-Fi signal that even if it falls short, it can’t help but beat out the competition anyway. One nice feature of the AmpliFi is a SmartTouch ability of the mesh router that allows you to see a display of your real-time networking status. AmpliFi works automatically with your router to ensure priority networks and devices are receiving the fastest possible connections. AmpliFi HD can also help save money on your energy bill. AmpliFi uses BlueTooth Low Energy with all connected devices, helping reduce the power consumption of your personal Internet of Things. AmpliFi is set up with a built-in firewall to protect you from viruses, Trojans and other malware. It also provides parents with a variety of access controls and monitoring devices, allowing you to see how your kids are using Wi-Fi on their personal devices, and allowing you to restrict access if necessary. Because of the enormous range available to you, AmpliFi HD is one of the best options for larger businesses and corporations that need to blanket a wide area in wireless mesh. If you need Wi-Fi for home use or for a smaller office, you may be better served by a less ambitious Wi-Fi mesh network system. The Orbi Home WiFi System from NETGEAR is often considered to be among the best mesh networks on the market. It’s an assessment I generally have to agree with. A typical Orbi WiFi system includes just one satellite, but that satellite works with the mesh router to cover up to an area of up to 5000 square feet! One of the most innovative features of the Orbi Home WiFi system is its use of Tri-band Wi-Fi. Most wireless routers operate on dual-band. By adding a third band, you have more speed and power to draw upon, allowing more devices or computer to work actively on your network before it is stretched. This is an excellent feature for businesses that depend on the internet for a lot of processes. Orbi gives you a lot of freedom over how to set up your network. You can choose to blanket your entire home or office with a single network, or you can create a myriad of networks for all of your users. Create workgropup networks for each team or division, and create a master network for yourself with the power to monitor your employee’s activities. You can also set up guest WiFi accounts for your customers to enjoy. If you need to add on to your mesh network, you have several options of satellites to choose from. There are small, compact satellites that simply plug into an outlet, managing to both be completely unobtrusive and take up practically zero space – these smaller satellites add 1500 square feet of coverage. If you need more expansions, you can purchase larger satellites that add 2500 square feet per unit. The difference between Orbi and, say Google WiFi is night and day. Google WiFi transfers data at a rate of 1200 mbps. Orbi transfers data at 3000 mbps – 2.5 times faster speeds. If you require demanding internet usage or need a lot of large files transferred quickly, Orbi is an excellent choice for your business. 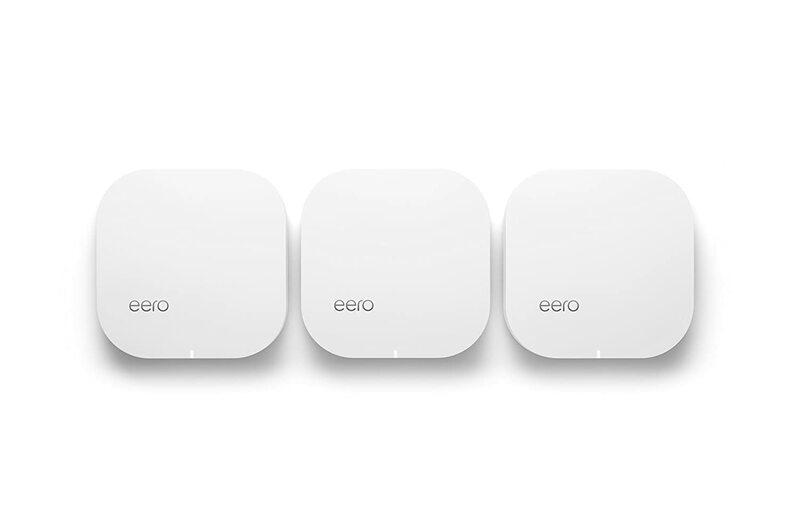 The eero Home WiFi System is frequently regarded as among the finest WiFi mesh systems on the market. As I understand, this reputation is partially because they were the first on the scene. They literally championed the development of wireless mesh networking. After trying out the eero, examining its system specs and measuring its performance, I have to agree that it is among the finest WiFi mesh systems on the market. Unfortunately, it’s age is starting to show. Newer, flashier models have arrived on the scene, boasting far more coverage than eero is capable of. When I speak in qualitative terms, I’m not talking about performance itself. Pound for pound, eero mesh WiFi is incredible, easily offering some of the best speeds and performance of any mesh system, although Orbi outperforms it. The problem is that, pound for pound, you get a lot less coverage with eero than with Orbi or AmpliFi. Google WiFi also covers a larger area, but eero offers superior transfer speeds. Each eero satellite covers approximately 1000 square feet, and the eero comes in a pack of three, providing mesh coverage for 3000 square feet However, the eero is also significantly more expensive than several models that offer 4500, 5000 or even more square feet of coverage. Having said this, the second generation of eero satellites will soon be available; by the time this guide is published, it will already be for sale on Amazon. The new eero promises twice the transfer speeds, most likely 3600 mbps or more. It will presumably also cover a greater area. It will also utilize the new tri-band wireless standard implemented by Orbi, and it will be compatible with the Alexa app. eero is a good mesh network system, but my advice is to skip this model and purchase the 2nd generation eero when it is released. Although it’s priced at over $100 more than the 1st generation eero, the increase in performance will be worth it. You could almost say the brand name Securifi is a compound word. By fusing together “security” and Wi-Fi,” the company is letting you know what they value most in a Wi-Fi internet: strong protection from outside threats. Fortunately, the Securifi Almond 3 is able to deliver on these promises. The first thing you’ll notice about Securifi Almond is how easy it is to set up. This is true of most mesh systems, and I haven’t really mentioned it before, but it’s especially true here. You don’t need to access a computer to activate Securifi either. The security protocols are pretty great, up to and including a security warning that alerts you to potential threats, a feature that is especially helpful in a professional environment. As far as wireless coverage goes, however, the Almond 3 is not as capable as many other models. Each satellite covers approximately 1300 square feet, allowing three satellites to cover just less than 4000 square feet. While by no means the worst performance, it stops the Almond 3 from getting full marks. Side note: Where the Securifi does receive full marks is in its ability to act as a hub for your smart home. Most Wi-Fi mesh systems are just that – mesh systems. They provide internet coverage, but depend on an external smart hub, such as Amazon Echo or Samsung SmartThings to coordinate your Internet of Things. You will have better success buying a dedicated smart hub, but for those who aren’t convinced of the value of a smart hub, the Almond 3 can serve as an excellent introduction. Last but certainly not least, we come to the Linksys Velop Tri-band Whole Home WiFi Mesh System. The Velop is available in packs of one, two and three, and the price is almost exactly what the 2nd generation eero mesh system will cost. At the time of this writing, however, eero is an unknown quantity. Linksys Velop is not. Velop offers by far the fastest wireless data transfer speeds of any mesh system I know of – 6000 mbps, double that of the Orbi satellites. Like the Orbi, Velop utilizes the latest tri-band standard, offering more speeds and higher bandwidths, allowing more network users than ever before to effectively utilize the wireless connection. The range of the Velop is not insignificant either; three satellites combine to cover 6000 square feet of area, a phenomenal achievement by any definition. Perhaps when the 2nd generation eero is released, Linksys Velop will be dethroned. At present, however, they are the king of the WiFi mesh network system. There are so many excellent choices that it may be difficult for you to make a decision. If you still find yourself hesitating, I’d like to direct you back to our editor’s pick. The Linksys Velop may be the most expensive mesh system, but it also offers the best performance. When you’re running a business, you can’t afford anything but the best.